NIA and ATS officers camped at Gosabara creek, around 19 km south of Porbandar, with earthmovers and dug up the seashore throughout the day. 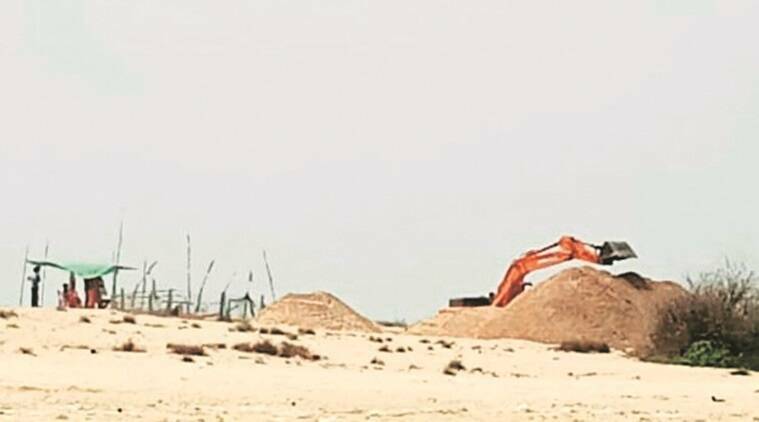 THE NATIONAL Investigating Agency (NIA) and Gujarat Anti-Terrorist Squad (ATS) on Wednesday dug up a spot at Gosabara, the site of RDX landing of 1992-1993 Mumbai blasts case in Porbandar, after reportedly getting an input that something incriminating could be lying buried on the seacoast. However, the operation did not yield anything. “The NIA had some information and we accompanied them at Gosabara. But nothing substantial or incriminating has been found from there and the operation is over,” ATC chief Himanshu Shukla told The Indian Express. Incidentally, it was at Gosabara that a consignment of RDX and other arms sent by the alleged plotters of the 1993 Mumbai blasts had landed in 1992-93. The arms and ammunition had then been transported to Mumbai to carry out the serial blasts that left hundreds dead. Umarmiya Bukhari alias Mammumiya Panjumiya, a suspected aide of the serial blast mastermind Dawood Ibrahim and a resident of Porbandar, was arrested in connection with the RDX landing case. He was subsequently booked in 19 other cases. However, he has either been acquitted or discharged in 17 of them, while three cases against him are pending. The Supreme Court had granted him bail last year in the 1993 Gosabara RDX landing case.